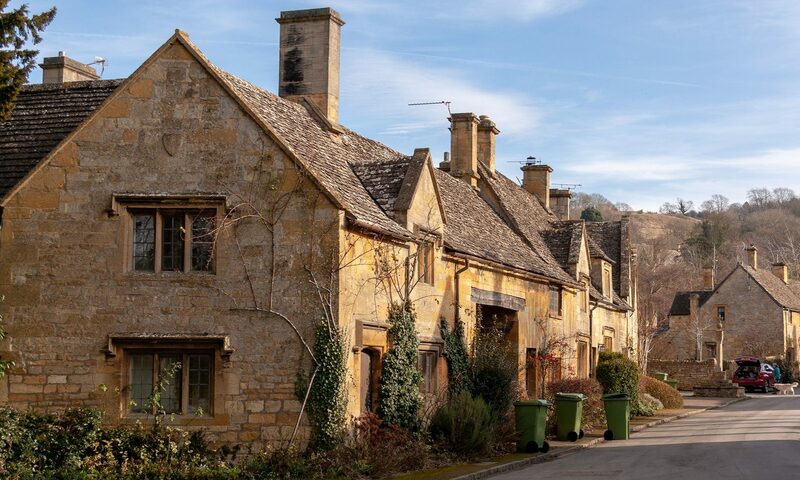 With honey coloured stone cottages and red chestnut trees lining the streets, it’s no surprise that the village of Broadway is one of the most picturesque villages in not only the Cotswolds, but the country. Luring international visitors to the beauty spot each and every year, Broadway is often referred to as the ‘Jewel of the Cotswolds’ and remains one of the most sought after areas around. Nestled at the foot of Fish Hill, which was quirkily named by those who say monks used to store fish there in the 18th century, Broadway could be mistaken for an immaculate film set. The ‘jewel’ of a village, which lies in the western area of the Cotswolds in the county of Worcestershire, is within easy reach of places such as Stratford upon Avon, with its Shakespeare Theatre as well as Warwick with some of the finest medieval castles in England and is just a two hour drive from central London. Much of the magnificence is due to its particularly wide high street and the majestic mix of Tudor and Georgian period buildings and with its quiet and relaxed atmosphere, the village has created a pretty picturesque setting for a UK getaway. Broadway, not to be confused with the New York’s City very own Broadway, has a grand reputation as the gateway to the quintessential English countryside and there are many ways to appreciate the beauty of the village whilst taking in the sights of the surrounding areas. Home to the second highest point in the Cotswold, visitors are able to take in the sights of the countryside at the top of the Tower, built by the Earl of Coventry in the 18th Century, which is easily the best way to take in spectacular views of 12 English countries at a staggering 65 feet high. Elevated above the landscape, the hilltop of Broadway offers incredible 360 degree views of untouched natural beauty. The area is also what many call a country walkers ultimate paradise with several incredible routes around Broadway which showcase the beautiful English countryside. Just a few minutes away from the Cotswolds Way Trail, Broadway is perfectly situated for a stroll through the bluebell woods to the quiet village of Buckland, a walk to the historic market town of Chipping Campden and a jaunt to the old church of St. Eadburgh’s. Whichever route you choose, the rural tranquility of the Cotswolds countryside will be on show for all to see. Whilst the beauty of the village is certainly a big attraction, it is not the only draw for tourists who arrive each and every month. Broadway has a particularly interesting artistic heritage, with the village at the very heart of creative inspiration for a number of writers and artists in the past including John Singer Sargent, dubbed the ‘leading portrait painter of his generation’, Henry James, one of the key figures of 19th century literary realism and William Morris, associated with the British Arts and Craft Movement. With such a rich artistic history, the village is now home to a number of the country’s best art galleries including The Priory Gallery, Richard Hagen Gallery and The Broadway Museum and Gallery, a community museum that tells the tales of the village through history by displaying stunning works of art. If you’re looking for a scenic spot to eat lunch or grab a coffee, the village’s high street, named as one of the longest in England, is brimming with high quality restaurants, cafes and bars, with more than enough choice for even the pickiest eater. For those wanting the ultimate British experience, you couldn’t possibly leave Broadway without indulging in an afternoon tea or two, and with an array of quirky and quaint cafes to unwind over a pot of tea and scones, you’re incredibly spoilt for choice! The high street is also perfect for those wanting to indulge in a little retail therapy too, with gift shops, clothing stores and a wide range of high quality antique shops which are sure to strain the old purse-strings! With a fabulous choice of retail therapy combined with great food and drink and an all around laid-back vibe, there really is no wonder Broadway is one of the most popular places in the Cotswolds to visit whatever time of year it may be. Whilst the historic village can be a perfect place to spend the day with family and friends, it’s also a quaint and quiet place to spend a night or two. There are hotels and B&Bs a plenty in Broadway however one you may have heard of before is the famous Lygon Arms Hotel which is somewhat of a Cotswolds institution, with it’s roots dating back to the 1300s. Centuries old, it is known by many as the home to some rather royal guests including King Charles I, King Edward VIII and guests are even able to reside in the room that Oliver Cromwell spent the night before the Battle of Worcester, so if you’re looking for a little traditional luxury, this might just be the place for you. The historic Cotswolds village of Broadway is a truly memorable place to visit and stay and acts as the ideal base from which to explore the surrounding areas. The spectacular scenery may lure both national and international visitors each and every year, however Broadway really does have the whole package with a range of high quality gift and antique stores, luxurious restaurants, cafes and tea-rooms as well as fantastic hotels and B&Bs. When it comes to UK getaways, it really doesn’t get better than this – the ‘Jewel of the Cotswolds’ truly is a treasure of the English countryside. P.S Due to Broadway’s strong and historic art connections, the village hosts a fantastic biennial Arts Festival with live music, exhibitions, events and lectures which is fun for groups of every age. If you are interested in attending this event, make sure you get the date in your diary for next year because it’s definitely an event for art lovers not to miss!